Last week we saw that the people of Israel, again, turned from God– and, again, God pursues them. 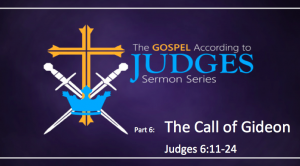 This week we will look at whom God chooses as the fifth Judge of Israel. As we do, we will see some truths about God that we need to remember as we face the challenges in our lives. To prepare, read Judges 6:1-24 and ask yourself this: What does this story reveal about God.